Four rose preparations take effect in Rose Nurturing Body Cream. Rose wax, essential rose oil and extracts of wild rose fruits and rose petals harmonise the skin. They form the heart of the balancing Body Cream, which offers warmth and serenity by enveloping the senses in a wondrous fragrance of roses based on a rich woodiness. The creamy yet rich formulation stimulates and fortifies the skin’s natural protective abilities. Shea butter from the organic wild collection project initiated by Dr. Hauschka in Burkina Faso joins forces with almond and jojoba oil to provide intensive skin care. The result: velvety soft skin. 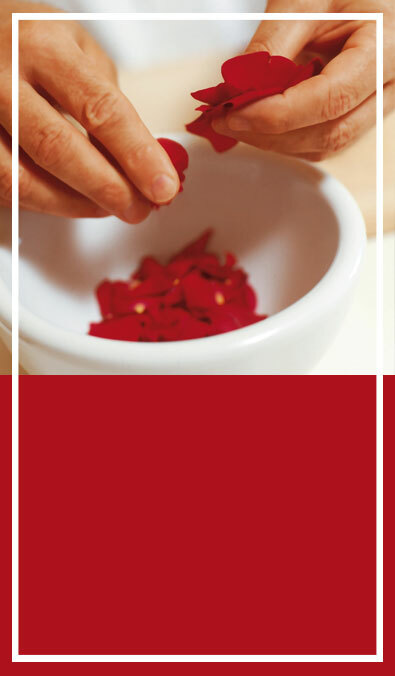 Why is rose used as an ingredient in Dr. Hauschka products? It’s not enough just to say: it contains rose. It’s also about the ‘how’. Sometimes we use essential rose oil, sometimes extracts of the fruits. At other times we choose rose water or even an extract obtained from the petals. Just as you can eat a carrot raw or stew, boil or roast it and unlock new secrets every time, the way in which a medicinal plant is prepared is extremely important. The decisive factor is always what it does for people in the product. The word rose is thought to come from the Indo-Germanic word vrod or vrad, the meaning of which is retained in Sanskrit as vrad = tender. Almost all of the world’s languages have a word for the rose; it is only absent in the language of the Inuits. The rose was already the symbol for love, beauty and grace at a very early stage and in Greece it also signified a great lust for life. This wondrous creation seemed to be so unearthly that in many cultures it was seen as a gift from the gods, particularly those of love and fertility. The rose is also the flower of wisdom and a clear mind. Sub rosa dictum: the dictum under the rose was the stock phrase of secret societies such as the Rosicrucians and the Freemasons, which adopted the white rose as their symbol and hung it over their table as a stuccoed rose. A promise made under the rose was deemed to be completely confidential. The rose’s golden age as a healing plant came with the pharmacists’ rose (Rosa gallica) in the 13th century in Provins near Paris, where it arrived from Damascus. For almost 600 years Provins was the centre of medicinal rose cultivation. Medicines made from roses were sent from there to all over the world. Over 20,000 varieties, innumerable colours from yellow, orange and white to pink and red, single and double flowers, bushes, climbing or erect growth. The range of rose (Rosa spp.) varieties is seemingly endless. Its wild bushy forms come from the Orient and are thought to have spread from Persia and Babylon via Egypt to Greece and Italy. Despite their differences, roses have one thing in common: the fivefold symmetry of their flowers. In other words, each flower head has five petals or a number of petals that is divisible by five. Each of these petals has its own form. Even the five green base leaves that cup the blossom petals from below differ from one another. Rose hips develop from the rose petals. As the fruits of the rose, their form is as diverse as that of the petals. A further typical characteristic of roses are their thorns, which are actually classed as prickles from a botanical perspective. Unlike thorns, which are created through the transformation of stems or leaves and grow as a fused part of the plant, prickles can be easily detached. The original rose varieties firmly embed themselves in the ground with their deep roots. Some hybrid tea roses lack this strong root system and are therefore grafted to the roots of a dog rose. Roses can be used in all sorts of ways. Rose petals contain essential oil, tannins, nectar, lipids, wax and resin, among other things. With the aid of distillation, both rose water and essential rose oil can be obtained from the rose petals. 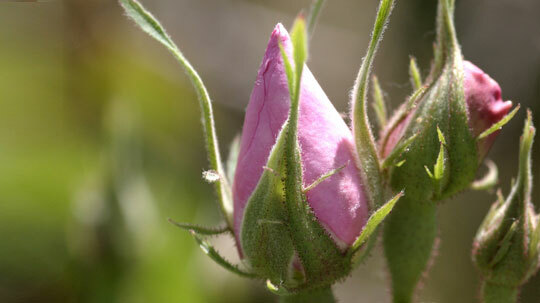 Rose oil has been shown to contain more than 400 individual constituents. Due to its complexity, the natural scent of a rose cannot be 100% synthetically replicated. In aromatherapy, essential rose oil is used for its relaxant, de-stressing and mood-lifting properties. The wax extracted from the rose petals has a very fine and silky consistency. Rose hips contain high levels of vitamin C, plant acids and pectins, and are strengthening. For Dr. Hauschka Skin Care products, we use rose extracts that have been prepared in several different ways: essential rose oil, rose water, rose wax, oil extracts from dried rose petals, aqueous, rhythmitised extracts from fresh rose petals and extracts of wild rose fruits (rose hips). 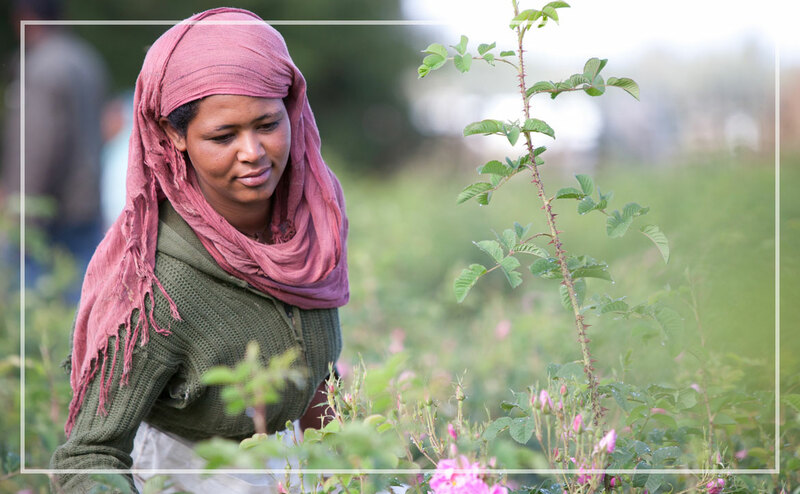 We procure the essential rose oil from our independent partners in Ethiopia, Afghanistan, Bulgaria, Iran and Turkey. These obtain the oil from Damask rose petals through the use of steam distillation. It takes about a hectare of roses to obtain a kilogram of the valuable oil, which is used in many Dr. Hauschka skin care products. The partners grow the roses using certified organic or Demeter cultivation methods. Our agricultural consultants regularly visit the countries and support them with their experience. Grants for the purchase of rose cuttings or the construction of distilleries help new partners who are just starting out in rose cultivation. This is in line with our commitment to high quality. As, whenever possible, we only use raw materials obtained from biodynamic or certified organic cultivation, we believe that it is very important to establish new, independent raw material partnerships. With the aid of our support and guaranteed purchase prices, new jobs and better living standards are created locally. In Afghanistan, for example, the cultivation of roses offers people an alternative to growing opium poppies. 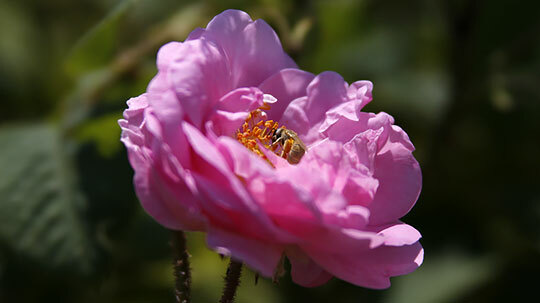 Essential rose oil in Demeter quality comes from a rose farm at an altitude of 2,900 metres. This is the first African rose oil from the south of the Sahara. Certified organic essential rose oil is produced by a community that has organised itself as a kind of corporate foundation. The project was initiated, and for many years supported, by the World Hunger Organisation with the aim of offering an alternative to the cultivation of opium poppies. 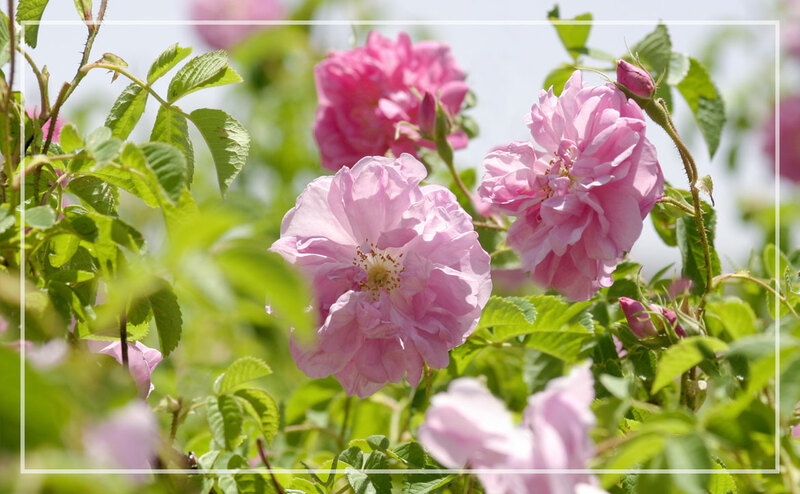 We obtain organic-quality essential rose oil and dried rose petals from a company in southern Iran which belongs to a foundation that demonstrates a high level of social and cultural commitment. 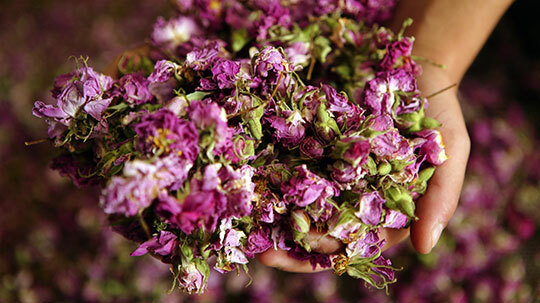 We obtain essential rose oil in organic and Demeter quality as well as rose water and rose wax from Turkey. We have worked with a cooperative in the south-west of the country for more than 20 years. 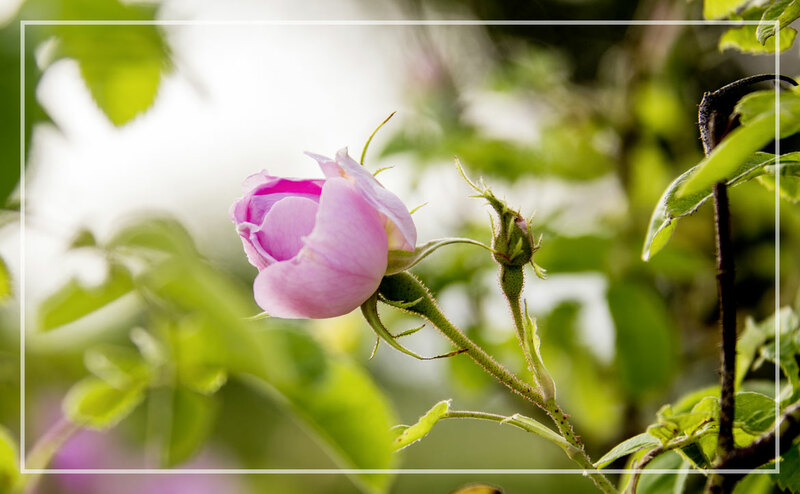 We obtain organically certified essential rose oil from several small producers in the Rose Valley, which has a century-old tradition of rose oil production. 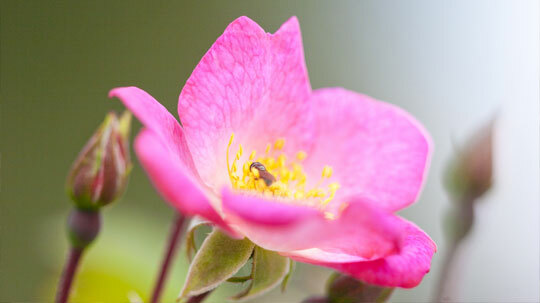 The rose hips from the dog rose (Rosa canina) come from various sources including our own Demeter farm, the Sonnenhof. Would you think about saying a rose is full of contrasts and contradictory in the way it expresses itself? Probably not. And yet, this is very much true. A rose is strong but also soft; resistant and thorny but tender; upright and yet enticing and smells sweet yet also bitter. It opens itself up with its fragrance and contracts with its abundance of tannins. And yet, the rose is a symbol of the purest harmony. It has the strength to bring together its contrasting elements and create complete strength of expression. It shares this strength with man. The manner of preparation highlights different aspects of the rose: the essential oil sends us on a journey full of dreams, from which we gather strength. The warm oil extract with almond oil accentuates the rose’s soothing, rich and protective qualities, while aqueous preparations are dominated by its fortifying and generally harmonising abilities.